Home Is you UPVC Door Secure? According to the Office for National Statistics there were 701,000 burglaries reported in England and Wales last year. Insecure doors and windows are screaming out for those uninvited guests, with the most burglaries committed by forcing old rotten or poorly maintained windows or doors. So, what are they and what can you do about them? At face value, PVC panel doors appear a pretty secure option. When they were first introduced it appeared that they represented a major step forward in door security. Traditional timber doors used a simple mortice lock and with either one or two bolts at the top or the bottom of the door. PVC-U doors in comparison introduced multi-point locking. This mechanism was and remains a major innovation in door security. Rather than relying on just one or two bolts, PVC-U doors – and today’s high security composite doors which have since followed them fire a series of bolts and hooks into the door frame, locking the sash and door together in a vice-like grip, as you lift the handle. 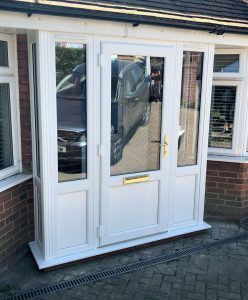 This is all well and good but if you take a determined enough kick at an older PVC-U door, the central panel will most likely collapse and you can simply crawl through the hole – something not lost on burglars. Second generation UPVC doors addressed these problems, introducing structural reinforcements, which withstand huge forces. Job done? Actually, no! PVC doors were a cutting-edge product. The use of PVC as a low maintenance door material was new, it’s locking mechanism was new. And as is so often the way in new technologies from new model cars to tumble dryers, it’s only after they have been in use for a little while that vulnerabilities become exposed. They used a new type of door locking cylinder. It’s important to note that we’re not talking about the locking mechanism which shoots multiple hooks and bolts to fix the sash to the frame but the ‘lock’ or the cylinder which you insert the key into to fix that mechanism in place. This includes a method which leaves no obvious signs of forced entry and which could mean that your home insurance company may not pay out for any losses. The ‘bumping’ method uses a skeleton key readily available and bought cheaply over the Internet to gain access to the cylinder lock mechanism, knocking the pins which lock the cylinder and door mechanism, out of place. A second method, ‘snapping’ which forces cylinders is now beginning to rival the number of break-ins through bumping. Handles are removed and the protruding part of the cylinder is snapped either through the force of an impact or the use of tools, commonly mole grips. Premier Windows offers a wide choice of Secured by Design approved front doors and back doors. This means that they meet not only the requirements for door security set out in the Building Regulations PAS24:2016 test and Part Q but the far tougher and independently tested criteria set out by the police approved Secured by Design scheme. Our front and back door composite door and PVC ranges are supplied to PAS24:2012 Part Q specification as standard with UK Police approved Secured by Design options available across our ranges. Our PVC panel doors feature new robust vacuum and pressure bonded panel, featuring reinforced core and highly insulated core, making them not only secure but highly energy efficient. They’re also available in a wide choice of colour and finish options including woodgrains. Our composite door range offers the appearance of natural timber but without the associated maintenance. They won’t warp or expand and don’t require painting. With an Insulated thermally efficient core they’re also tested to be almost 20 per cent better at keeping the warmth inside your home and your energy costs lower, than a traditional solid timber door.